Greg Santos, a Canadian poet and graphic designer who teaches creative writing to at-risk youth, is also the poetry editor for carte blanche. He lives in Montreal with his wife and two children. Greg and I know each other via social media, both of us having been active participants in a couple of projects sponsored by The Found Poetry Review (FPR). 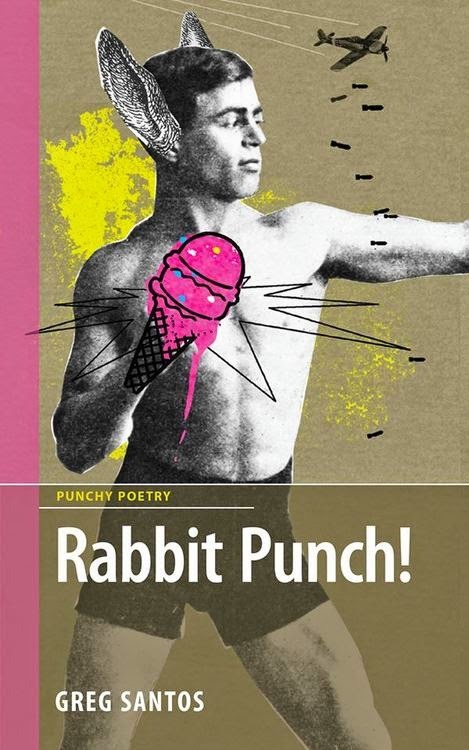 When Greg's second book of poetry, Rabbit Punch!, was released, he asked me to review it. The book's cover and title, as well as what I knew of his poetry, led me to suspect that the book would be an imaginative foray into pop culture, that it would be filled with humorous, witty—at times dark or surreal—poems. I accepted his invitation. As it turns out, the book is as I anticipated; it does not disappoint. You can read all about it in the review below. Greg was also kind enough to do an interview. You can find out more about his thoughts on poetry and his books here. Greg Santos' second book Rabbit Punch! is filled with lithe poems, quick on their feet, poems that are witty, whimsical, serious, sarcastic, celebratory, bittersweet. Some are entertaining, while others are deceptively so—poems layered with meaning that reward upon repeated readings. Santos has dedicated the book to the memory of his mentor Paul Violi and in some of the poems, it's evident that such mentors and favorite poets have exerted a heavy influence over Santos' work. The farmer has a basket full of eggs. He wonders if he should bring them back to their coop. But they are his children and he is hungry. And in “Hansel and Gretel,” Santos depicts a story different from the Grimm Brothers' version. Instead of victims, in Santos' world, Hansel and Gretel are instigators, defying their parents because they want to find the witch—they’re actively seeking “peppermint, floss, and doom.” The line “We were ready to die for love” and last line of the poem “At long last, love in all its glory” suggest that Hansel and Gretel believed the witch to be Love. There are a number of ways in which to read that sentiment. One of the more obvious ones is that Hansel and Gretel were evil like the witch. Another is that they were so unloved they would love anything that beckoned, so desperate that they grasped at evil, thinking that's what love looks like. While both readings are surprising and fresh, the second is punch in gut that left this reader thinking about it for days. The second section of Rabbit Punch! is prefaced with the first three lines of Dean Young's "Sean Penn Anti-Ode." It's an appropriate presage for this section filled with poems about Western public figures, cultural icons, and folklore: Canadian Prime Minister Stephen Harper, model/socialite Paris Hilton, caped crusader Batman, the actor Charlie Sheen, American politician John McCain, the Tooth Fairy, aliens, and more, all find a home in this section. A number of these poems in the second section are dramatic monologues written in the persona of a famous figure. In "I May Be Macho but I'm no Genius" (another one of Santos' poems that appears to be humorous, but is not), professional wrestler Randy Savage tells us "I'm more Burger King than Macho King. ... I wouldn't wish Macho Madness on anyone, brother." The last line "I miss Elizabeth," transforms the poem from one of sarcasm or mockery to one of sadness. Elizabeth had been Savage's romantic interest, as well as his wrestling manager. When she left Savage for another wrestler (Hulk Hogan), it unsettled the world of professional wrestling. Elizabeth was stalked and even injured. She died of a drug overdose in 2003. If the last line of the poem refers to when she left Savage, then the poem is a wistful one about heartbreak. However, if it refers to when she died, then the poem is one of mourning, a poem of grief and regret, especially in light of the poem's epigraph: "Reincarnation doesn't have to be. You can concentrate and you can mental telepathy. Yeah!" The epigraph is a quote by Savage from a 1987 promotional. The quote might elicit ridicule from the reader when first read, but by the end of the poem, all one feels is pity. It's not all famous figures in the second section. The poet-persona also makes an appearance, with the poet as a first person narrator. Even so, some pop-culture aspect is still prominently featured. For example, in "A Wild Night at Hooters," the narrator recounts a fictional evening at the American restaurant Hooters, an evening spent with famous dead poets and writers (e.g., "We'd get smashed drinking Coors, spot Whitman coming onto Frost, / we'd have to keep Yeats away from the dartboards.") And in the endearing poem "The Great Hoarder," which is the last poem of this section, Santos gifts us with a narrator who hoards in the spirit of Hoarders, that American television show about people who compulsively keep things forever. However, instead of hoarding material objects, the narrator hoards thoughts and questions while his family sleeps. In the third and final section of the book, we find a collection of surreal and experimental poems. The opening poem "Imaginationland" (which is also the title of a series of episodes of the animated TV show South Park) takes us on a quick jaunt through the "the Tim Burton-ish forest" in the narrator's head, where "squirrels dance merrily with foxes" and "My family waits for me in a gingerbread house." In addition, this third section houses poems about a New York that is "left of the center of the universe" and advice poems about how to handle ghost hares ("Don't play dead. And whatever you do, don't act like a carrot. / Wearing orange around ghost hares is suicidal.") There are poems about poems, even a poem that wants "you to trust it," but not immediately. No, it "wants you to hold hands first for a while before getting serious." In the last poem of the book, "A Vanishing Act," a magician pulls "rabbits out of a top hat," wields the tools of illusion "fog and mirrors," intones special words "to distract" the audience. Magician as conjurer; poet as conjurer. It reminded me of what Jane Hirshfield wrote in "Strange Reaches, Impossibility, and Big Hidden Drawers: Poetry and Paradox" (The Writers Chronicle, Feb 2015)—that in a good poem, sometimes one finds oneself "inside both the realm of the most common human truths and the realms of sequin and smoke, of scarf-trick and card-trick and mirrors that at once reveal and hide." One will find such poems in Rabbit Punch! 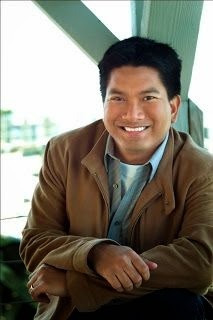 From poem to poem, one can sense Santos' imagination hard at work to extend, as he says in his interview, "poetry's potential to both entertain and enlighten." Santos shared that he was interested "in exploring the idea that everything and anything is fair game to be poetic fodder." And in that, he has found success. you can't help wondering if you've made the right choice. You make a left turn at Albuquerque. but he somehow turned out fine. A wrong turn didn't stop him. what didn't shoot Bugs made him stronger. He had the right idea. toward a golden carrot that probably never has or ever will exist. shotgun in hand, hiding among the welcoming throngs on the boardwalk. Remember, fold your rabbit ears under your bowler hat. He'll never suspect a thing. Nancy Chen Long received a BS in Electrical Engineering Technology and an MBA, worked as an electrical engineer, software consultant, and project manager, and more recently earned her MFA. As a volunteer for the local Writers Guild at Bloomington, she coordinates the Lemonstone Reading Series and works with other poets to offer poetry workshops. Her chapbook, Clouds as Inkblots for the Warprone (2013) was published by Red Bird Chapbooks. You'll find her recent and forthcoming work in Mason's Road, Boxcar Poetry Review, Sycamore Review, and elsewhere. Like a rabbit punch out of the blue. I'm just singing a requiem for all decent centaurs everywhere. Greg Santos’ newest book is Rabbit Punch! (DC Books, 2014). He is also the author of The Emperor’s Sofa (DC Books, 2010) and two poetry chapbooks. He holds an MFA in Creative Writing from The New School. His writing has appeared in numerous journals and anthologies including Drawn to Marvel: Poems from the Comic Books (Minor Arcana, 2014), Daddy Cool (Artistically Declined Press, 2013), A Face to Meet the Faces: An Anthology of Contemporary Persona Poetry (Akron, 2012), Mcsweeney’s, The Best American Poetry Blog, and The Feathertale Review. Greg is a graphic designer, teaches creative writing to at-risk youth, and is the poetry editor for carte blanche. He lives in Montreal with his wife and two children. For those who are not familiar with Greg's poetry, to give you a better idea of his work before proceeding to the interview, here’s a poem titled "Zombies," which is an example of his work with popular culture, containing references to the Irish rock band The Cranberries and American musician Rob Zombie. Congratulations on publishing your second book! While getting a first book of poetry published is difficult, getting a second published is even more so. Please share with us how Rabbit Punch! came to be and how you got it published. GS: Getting my first book, The Emperor's Sofa, published was really a dream come true. It was edited by poet and scholar, Jason Camlot, and published by the Punchy Poetry series, an imprint of Montreal-based DC Books. I'm very proud of my first book and if that had been all I had ever published, I would have been more than content to leave it at that. So I still have a hard time wrapping my head around having a second full-length collection of poetry out there in the world. I approached Jason with a second manuscript comprised of confessional poems written while I was living in Paris, where my wife was pursuing a research fellowship for her PhD. My first book had just come out and I was a new father living in the City of Lights. It was an exciting time, everything was new and terrifying. I tend not to write confessional poetry, so these poems were also new and terrifying for me to share with the world. After some discussion with Jason, we decided that the manuscript I sent him in its original incarnation did not quite fit with Punchy Poetry's mandate. That manuscript is still a work in progress that I'm hoping to publish elsewhere in the future. At the same time, he pointed out some poems that he felt we could work on together, in particular, "Reading Ou Yang Hsiu in a Café". He asked me if I had more similar pieces that we could compile into a separate project. Thankfully, I had been putting together a completely separate manuscript that I was planning on sending out to some poetry contests and that manuscript turned out to be Rabbit Punch! Rabbit Punch! has a good dose of pop-culture references. In a post for the Poetry Society of America, Adrian Matejka writes “Every important idea that poetry interrogates has a corollary in popular culture, and when poetry and pop culture team up like those Marvel comics, good poems can happen.” Please share some of your thoughts on the union of popular culture and poetry, how you find pop culture impacts your writing or your relationship to poetry, etc. GS: When I include pop culture references in my writing, I do so knowing full well that I am potentially opening up poetry to people who might not normally be inclined to read poetry. At the same time, I am also interested in exploring the idea that everything and anything is fair game to be poetic fodder. Paris Hilton, Bugs Bunny, John McCain, Hooters, and Batman might on the surface seem like odd poetic bedfellows, but TV shows, celebrities, comics, movies, music, spending our time on Facebook, for example, these things are all part of our vocabulary and daily lives, so why not attempt to incorporate them into our poetry? I’m not really doing anything new, though. Poets like Frank O'Hara, David Trinidad, John Ashbery, David McGimpsey, Denise Duhamel, to name a few, have all made great use of pop culture in their writing. I'd like to think of myself as following in their footsteps and playing with poetry's potential to both entertain and enlighten. Thinking back to your first full-length manuscript that was published, were there things you thought would happen, yet didn’t? unexpected things that did happen? GS: I was expecting, perhaps naively, to get more reviews for The Emperor's Sofa, but as a relatively new writer at the time, I'm quite happy with the reviews that the book did receive. I was particularly tickled when I heard from one of my wife's relatives that they had read a review of it in the Telegraph-Journal newspaper from Saint John, New Brunswick, Canada, which is near where they live. It was a really detailed and thorough review and I couldn't have asked for a better analysis. Reviews aren't everything, but for a new author like me, it was exciting to know that someone had actually taken the time to read and study my work. I would have liked to have done more readings for the book in Montreal, which is my hometown, and where my publisher is based, but like I had mentioned earlier, I was living in Paris the year the book came out. That allowed for some unexpected and very cool opportunities to promote the book. In particular, doing readings in Paris, Berlin, and London. My good friend, Joshua Levy, who's a wonderful poet and short story writer, was living in London at the time and he organized a lovely event at Goodenough College where I read alongside Todd Swift, a poet I've long admired. That was a real thrill and an honor. GS: "The Cremation of Sam McGee" by Robert Service was one of the first poems I remember reading when I was a child. I used to pore over my elementary school library’s edition of the poem that was paired with the colorful and haunting paintings by Ted Harrison. I recently found the book for my father-in-law after I found out it was his favorite poem. It wasn't until I was a teenager trying to write songs and lyrics to play on the guitar that I seriously started wanting to read and learn more about poetry. My songs were my first poems. It was around that time that I started reading e.e. cummings, Emily Dickinson, and my aunt's copy of Flowers for Hitler by Leonard Cohen. At a young age I knew I wanted a career in the arts but I was all over the place. I wanted to be a cartoonist, an animator, an actor, and the list goes on. I took my first poetry workshop as an undergrad at Concordia University in Montreal with poet, David McGimpsey, and it was an eye-opening experience. Until then, I had been trying my hand at both prose and poetry but there was something about that class that really clicked and made a tremendous impression on me. McGimpsey was a passionate teacher and he took poetry extremely seriously, despite his writing being some of the funniest stuff I had ever read. I really admired that. It was after McGimpsey’s class and because of him that I made the decision to buckle down and focus on learning as much as I could about poetry and I've never looked back. GS: There’s a quote from Gertrude Stein that I love: "I write for myself and strangers." I don’t normally imagine a reader. I’m usually too busy writing to exorcise an idea from my head or to make myself laugh. That said, if I were to imagine my ideal reader, I guess I would picture someone like me, only smarter. We met online when we were both participants of a Found Poetry Review project. When did you first become interested in found poetry? What attracted you to it? What sort of response have you gotten from your readers regarding your found poems? GS: I first became interested in found poetry when I started teaching poetry workshops. I was looking for more prompts that would force myself and students to think outside of the box and I discovered Austin Kleon's Newspaper Blackout. The book is made up of poems that Kleon created by taking a black sharpie and blacking out pages from The New York Times to create new texts. It's exciting and liberating to create something new out of existing works of art. In effect it’s a type of collaboration. Around that time I was also really interested in collage and remix culture. I started constructing poems using lyrics from pop stars like Britney Spears, Lady Gaga, and Miley Cyrus and rearranging the words into poems that I would call “poetry remixes.” This led me to seek out other found poetry forms and writing exercises. My chapbook, Tweet Tweet Tweet (Corrupt Press, 2011) contains more of my remixes and found poems, but I didn’t really include many of them in Rabbit Punch! except for “We Were Startled by the Sound of Fog”, which was an erasure poem using Out of the Fog by C.K. Ober (Associated Press, 1911) as a source text. I used the great Erasures website at Wave Books to create it and I was thrilled to find out that the poem was chosen to be the November 2014 Poem of the Month at The Montreal Review of Books. I was happy that an example of found poetry was being showcased, when it might not normally be seen by a mainstream audience. I - After writing out the first draft of a poem, I often eliminate the first line or two. I have a tendency to over explain myself and this helps cut out any superfluous words. II - Reading the poem out loud is always a good idea. If I find myself regularly tripping over any words, then that’s a surefire sign that something’s gotta go. III - Putting a fresh poem away and not looking at it for a while also helps when I return to it after giving myself a little distance. IV - I took a great workshop with poet Matthew Zapruder when I was doing my MFA in Creative Writing at The New School. One of the exercises he had us do was taking our completed poems and rewriting them backwards, meaning writing the last stanza first and so on. It doesn't always work but sometimes an odd juxtaposition surprises you and makes the poem sound more interesting. As an editor at carte blanche, what would you tell hopeful poets looking to find homes for their work? GS: I have way too many books on my to-read pile, and I am often reading more than one thing at the same time. I just finished two great novels, actually. Blind Spot by Laurence Miall, who is carte blanche's fiction editor. The protagonist, Luke, is a great anti-hero. I found myself disliking him, but wanting to keep reading to see what he was going to do next. The book reminded me of Camus' The Stranger. It's a remarkable debut novel. The second is 10:04 by novelist and poet, Ben Lerner. The book really brought me back to my time spent in New York as a graduate student and aspiring writer. The poets and writers that I often turn to for inspiration include James Tate, Kenneth Koch, John Ashbery, Dean Young, Charles Simic, Mark Strand, Mary Ruefle, Russell Edson, Elizabeth Bishop, Paul Violi, Lydia Davis, Robert Hass, Linda Pastan, David Lehman, David McGimpsey, Stuart Ross, Gillian Sze, and Ben Mirov. GS: Gee, I've never been asked that before! I would be a traveling carnival or a place like Coney Island. Complete with cotton candy, Cracker Jacks, haunted house, sticky floors, Ferris wheel, fun house mirrors, a sideshow, and clowns. Thanks again for the opportunity to be interviewed! This was fun. Nancy Chen Long received a BS in Electrical Engineering Technology and an MBA, worked as an electrical engineer, software consultant, and project manager, and more recently earned her MFA. As a volunteer for the Writers Guild at Bloomington, she coordinates the Lemonstone Reading Series and works with other poets to offer poetry workshops. Her chapbook, Clouds as Inkblots for the Warprone (2013) was published by Red Bird Chapbooks. You'll find her recent and forthcoming work in Mason's Road, Sycamore Review, Boxcar Poetry Review, RHINO, and other journals.